Looking for a fun + informative voice to ignite your wellness efforts? Let me add healthy-hype to your brand or business! 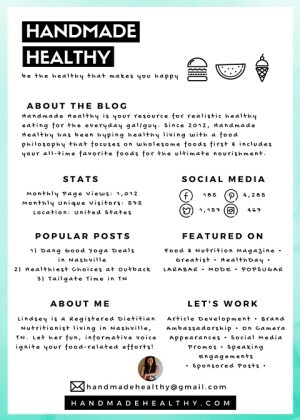 Lindsey is a Registered Dietitian Nutritionist (RDN), Weight Management expert, and the master mind behind HandmadeHealthy.com. She graduated from the Dietetic Internship program at Vanderbilt University Medical Center, and prior to this, earned her B.S. in Human Ecology from The University of Tennessee. Most recently, Lindsey received her Certificate of Training in Adult Weight Management from the Academy of Nutrition and Dietetics. She works as a consultant and healthy living expert for companies in the food and beverage industry, appearing on HealthDay Living, Local Memphis Live! and is a regular contributor to POPSUGAR and Greatist.com. Her passion for creative communications and “do-it-yourself” philosophy aims to help craft the healthy that makes YOU happy. Download my 2015 HandmadeHealthy Media Kit!